Chocolate Bourbon Pound Cake - crazy good! Easy home made chocolate pound cake spiked with bourbon. Flour, cocoa powder, chocolate pudding mix, baking soda, butter, sugar, eggs, sour cream and bourbon. Can make ahead of time and freeze for later. Perfect for potlucks, cookouts and watching the Kentucky Derby! 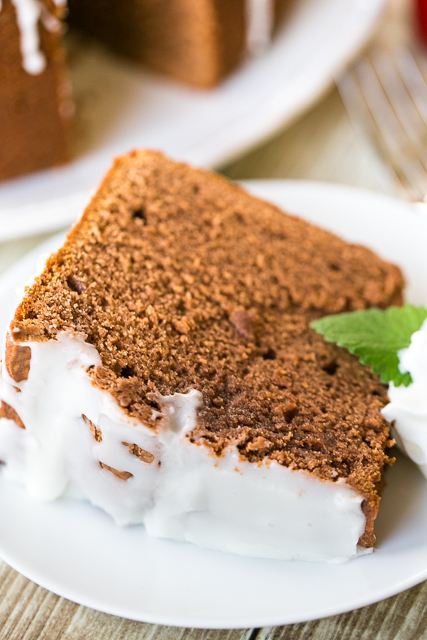 Everyone loves this easy pound cake dessert recipe! Pound Cakes are one of my favorite desserts to make. They are so easy to throw together and taste great. They can also be made ahead of time and even frozen for later. You really can't beat them! I've been experimenting with flavors and came up with this Chocolate Bourbon Pound Cake. OMG! SO good!! Chocolate + Bourbon = heaven! This cake is incredibly good. Delicious chocolate with a hint of bourbon. 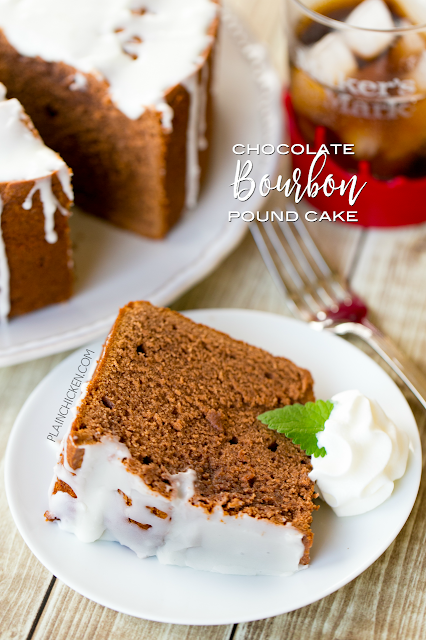 Just to make this Chocolate Bourbon Pound Cake even more delicious, I topped it with an easy bourbon glaze. YUM! We served the cake with some fresh whipped cream and mint. We also had a few slices topped with vanilla ice cream. This would be perfect for snacking on while watching the Kentucky Derby with a Mint Julep in hand! Preheat oven to 325 degrees. Butter and flour a 10-inch tube pan. Set aside. Sift together the flour, cocoa powder, chocolate pudding mix, salt and baking soda. Set aside. Cream together butter, and sugar. Beat for 2 to 3 minutes, or until light and pale yellow in color. Add the eggs, one at a time, beating well after each addition, stopping and scraping the sides of the bowl as needed. Reduce the speed of the mixer and add the sifted dry ingredients alternately with the sour cream. Mix until fully combined. Slowly stir in bourbon until fully combined. Pour batter into prepared pan and place in the oven. Bake, placing a piece of aluminum foil on top to prevent over browning, if needed, for 1 hour 20 minutes to 1 hour 30 minutes, or until a toothpick inserted into the center comes back clean. Remove from oven and let cool in pan on a cooling rack for 15 minutes, then remove from the pan and let cool completely. To make the glaze: In a medium-size mixing bowl, mix together the powdered sugar, bourbon and milk. Drizzle over cooled cake. Being from Kentucky, I appreciate this recipe. I've been to the KY Derby once, and now I just watch it on TV. This cake sounds perfect for eating and watching all day coverage!! Can wait to make it!